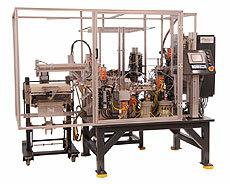 Automated packaging systems of all types can be integrated into Dial-X Automated Equipment, Inc. automation systems. Whether you need individual product packaging or bulk, bag or layer packaging, you can rest assured that it will work perfectly with your new automated system. By adding an automated packaging system to your automation assembly system, you can reduce even more labor and further increase your productivity and profit. Dial-X Automated Equipment, Inc. has the experience and flexibility to meet your exact packaging system needs. For further information or a free quote on automated packaging systems, contact Dial-X Automated Equipment, Inc.